Venerable Geshe Kelsang Gyatso is the Founder of the New Kadampa Tradition and is a fully accomplished meditation master and internationally renowned teacher of Buddhism. Geshe-la, as he is affectionately called by his students, is primarily responsible for the worldwide revival of Kadampa Buddhism in our time. From the age of eight Geshe-la studied extensively in the great monastic universities of Tibet and earned the title Geshe, which literally means spiritual friend. Under the guidance of Trijang Rinpoche, his Spiritual Guide, he then spent the next eighteen years in meditation retreats in the Himalayas. In 1977 he accepted an invitation to teach at Manjushri Kadampa Meditation Centre in England, where he lived for many years giving teachings and guidance to an ever-growing group of disciples. Geshe-la continued to teach on Kadampa Buddhism in many countries around the world until his retirement in 2009, and has published a series of remarkable books on Buddhist thought and meditation. He has established three unique study programmes and over 200 meditation centres around the world, trained qualified teachers and a flourishing ordained community, and created a project to build Buddhist temples in every major city in the world. In his teachings, Geshe Kelsang emphasises the importance of meditation and how to apply it in daily life, the need to be truly happy, and how to cultivate a good heart to help others, and he demonstrates these qualities perfectly in his own life. This remarkable teacher inspires so many people from so many different countries because he teaches from example. The elected General Spiritual Director of the New Kadampa Tradition is Gen-la Kelsang Dekyong. 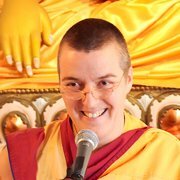 She lives at the mother centre of the NKT, Manjushri Kadampa Meditation Centre in Cumbria, and teaches at Buddhist festivals and celebrations around the world. 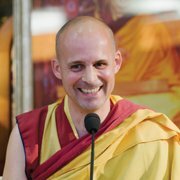 The Deputy Spiritual Director is Gen-la Kelsang Jampa, an American Buddhist monk who is based in Dallas. They are both senior disciples of Venerable Geshe Kelsang, who are able to use their deep personal experience to explain Buddha’s teachings in a way that is uniquely applicable to our modern lives. 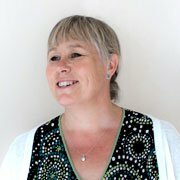 The principal teacher at Nagarjuna KMC is Kadam Bridget Heyes, who is also the National Spiritual Director of the UK. She is a senior disciple of Geshe Kelsang who has been practising for over 20 years. Her down-to-earth teachings and joyful example are an inspiration to all.